What’s better than cup of hot cocoa? 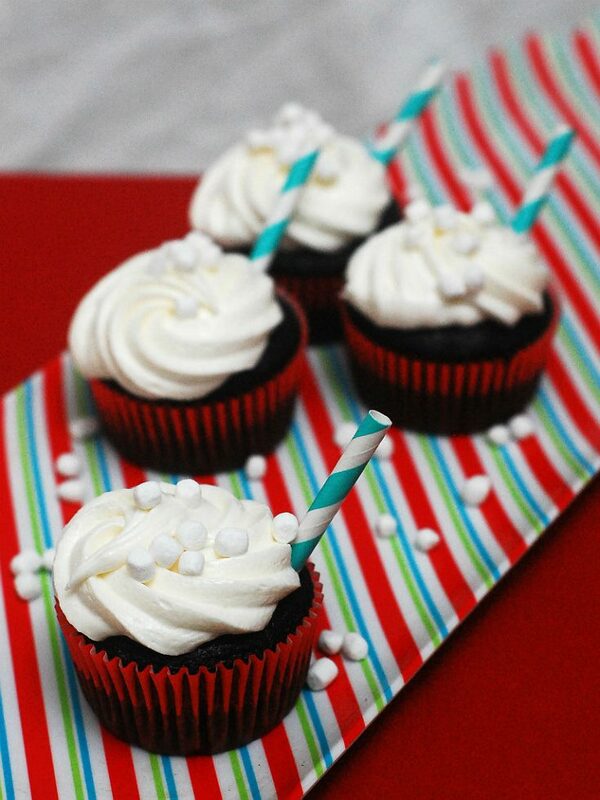 Hot cocoa cupcakes! 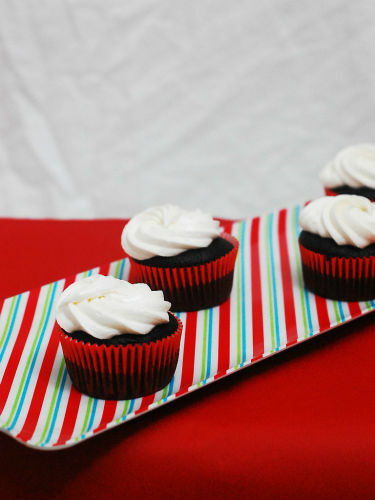 Prepared cocoa adds flavor to the cupcake batter, and they’re finished with a swirl of marshmallow buttercream on top! One of my favorite things to do as a blogger is participate in blog “events,” like Cheesecake Day and Ice Cream Week. A few months back, I noticed that there weren’t any coming up. So I decided to host my own, and invited some blogger friends (who in turn invited their blogger friends …). I love this community! I saw that December 15th is National Cupcake Day. After all, who doesn’t love cupcakes?? You get all of the best parts of a piece of cake — cake and frosting — in a portable little package, no plate and fork needed. Except that December 15th is the posting date for the Food Blogger Cookie Swap (so don’t forget to check in that day for an awesome cookie recipe!). So, we moved Cupcake Day up a week. After you’ve drooled over these cupcakes, don’t forget to check out the other links at the bottom of this post! It took me a long time to settle on a cupcake recipe. I wanted something somewhat winter-y. Did I want to focus on cupcake flavor? Or cupcake decoration? The answer actually came to me the night we got our first snow, as I was curled up on the couch with a cup of hot cocoa, complete with marshmallow bits. I took my favorite chocolate cake recipe, and instead of mixing in prepared coffee, I made it with prepared hot cocoa. And they just wouldn’t — couldn’t — be hot cocoa cupcakes without marshmallow! I added marshmallow creme to a quick buttercream recipe, and voila! And just because there’s no such thing as too much marshmallow, I added marshmallow bits on top. Mix the contents of the hot cocoa packet with the hot water. Set aside to cool. 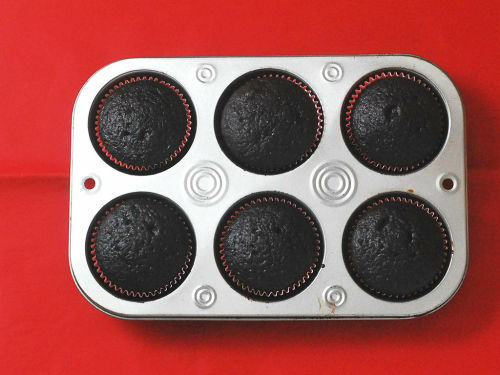 Preheat oven to 325 degrees, and line a 12-well cupcake pan with paper liners. Place the flour in the bowl of a stand mixer, and sift in the sugar and cocoa powder. Stir in the baking soda and salt. Add the egg, oil, and half the hot cocoa. Mix on low speed just until combined. Add the remaining half of the hot cocoa and the vanilla. Mix on low just until incorporated, then beat on medium speed for 3 minutes. Divide the batter among all the cups, filling each about 3/4 full. Bake for about 20 minutes, until a toothpick inserted in the center comes out clean. Cool completely. To make the frosting, beat the butter on medium speed until light in color and fluffy. Beat in the vanilla. Add the powdered sugar, 1/2 cup at a time, beating until well-incorporated before adding more. Beat in the marshmallow creme just until fully mixed. 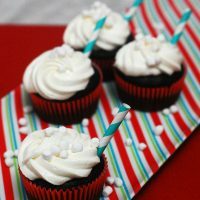 Transfer to a piping bag fitted with a piping tip, and pipe a swirl of frosting onto each cupcake. Garnish with marshmallow bits, if desired. Don’t forget to check out the other Cupcake Day recipes! Thanks so much for hosting this fun party. Your cupcakes are very creative and look absolutely stunning. I can just imagine how great they taste. Thank you so much for coordinating this fun cupcake celebration – so many delicious options today! These hot cocoa cuppies look FANTASTIC!! Ugh, these just look too good! Hot cocoa flavor baked into cupcake and topped with marshmallow icing is genius, Coleen! Thank you so much for organizing this fun event! So in love with the idea of marshmallow buttercream. 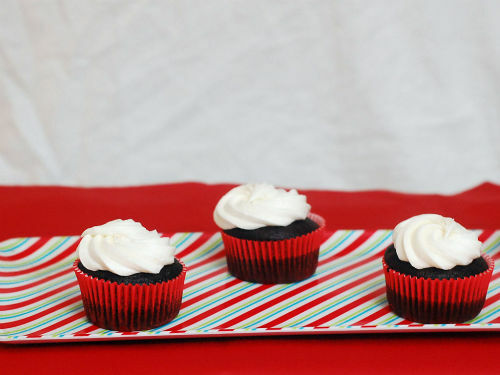 Perfect on top of these hot chocolate cupcakes! Brilliant Coleen! Your idea to switch coffee with cocoa is indeed inspired. Who doesn’t love extra chocolate? P.S. Looking forward to making your marshmallow frosting, too. Thank you too Coleen for hosting this fun event! Wow, don’t those look fabulous!! Thanks again for hosting!! omigosh that frosting! those oh so chocolatey cupcakes!! LOVE. Thanks so much for making this happen Coleen! Love this flavor for a cupcake – so fun! I had no idea there was a National Cupcake Day. Next year maybe I will be prepared. Thanks so much for putting this together. These cupcakes looks amazing. I’m definitely trying these! Great use of hot cocoa mix! And thank you for hosting the party – it was so fun and I hope we do it again soon! These are SO perfect for the holidays. There’s nothing better than a steaming hot cup on cocoa during the winter…it’s actually been cold enough in South Florida lately for me to make some! Oh, I love hot cocoa in the winter- this recipe is perfect for my next family gathering! Why doesn’t your site accept Email subscription? I want VERY much to follow you. Where can I do that? These came out dense and gummy. The flavor was good, but the texture was off. How much baking soda did you use? The measurement in the recipe is in ounces, not teaspoons. Well that explains it, thanks for pointing that out! I’ll have to retry.